Construction of the Delaware and Raritan (D&R) Canal began in 1830 to provide a swift and safe route from Philadelphia to New York City. The ensuing endeavor cut a large meandering letter "Y" through central New Jersey and the southern Skylands Region. The main canal emerged from the Delaware River just north of Bordentown and ran 44 miles into New Brunswick where ocean vessels reached via the Raritan River. The other arm of the "Y", the feeder canal, ran along the Delaware River beginning at its highest elevation at Raven Rock and joined the main channel 22 miles south at Trenton, 14 feet closer to sea level. The waterway itself is equally obliging, offering canoeists (etc.) a luxuriously lazy drift along nearly 58 miles of inland flow by 19th Century bridges, locktender houses, cobblestone spillways and hand-built stone-arched culverts. Only occassional portage is required at locks and some bridges. And fishermen consistently find the canal ripe with trout, bass, pickerel and panfish. Today the canal's route provides a 67 mile corridor of recreation and wildlife that invites your pleasure by foot, bike or canoe. The tow path, along which mules drew loaded barges along the waterway, still exists, for the most part uninterupted, providing a natural surface of negligible incline easy on walkers and bikers. 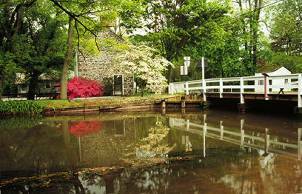 You can access the tow path at many locations in Somerset County including East Millstone, Blackwells Mills (Park HQ), Griggstown, Rocky Hill and Kingston or in Hunterdon where one section parallels the Delaware between the Prallsville Mill, (headquarters of the D & R Canal Commission) in Stockton, and Frenchtown, passing through the Bulls Island section where the feeder canal actually begins. The trail continues north to Frenchtown on the abandoned railroad right-of-way where the actual park system ends, although the canal continues to Milford. But plans are underway to purchase one section and gain an easement for another in order for the D&R park to extend to Milford. In essence, a jaunt from Washington Crossing would lend itself to quaint pit stops in Lambertville, Stockton, Frenchtown and Milford, all great places to eat and browse. A lot of people use the park for recreational purposes, but may not understand why the canal was built and what it was used for in New Jersey's history. Some people believe the canal is a natural feature and don't realize it was man-made. Completed in 1834 for $2,830,000­ and a much dearer cost in the lives of scores of Irish immigrants who died from Asiatic cholera­ the canal was built as a joint venture of canal and railroad interests. The engineering of the canal proved well-studied, as the resultant system of locks, combined with accurate calculations of width, depth and water flow, required minimal refinements during the commercial life of the canal. The flow in the main canal, 75 feet wide and 7 feet deep was sustained by the feeder, 22 miles long, 50 feet wide and 6 feet deep. The D & R quickly became one of America's busiest navigation canals. During the peak years of the 1860s and 70s, coal making its way from Pennsylvania to new and thriving industrial furnaces in New York City made up 80% of the canal's cargo. In 1871, nearly 3 million tons of cargo were shipped on the Delaware & Raritan­ more than was carried in any single year on the much longer and more famous Erie Canal. The feeder canal along the Delaware was similarly navigated from the time of its completion, and canal boats arrived from New Hope to lock into the feeder at Lambertville. In 1855, the Belvidere-Delaware Railroad completed the laying of track along the feeder for wintertime supplement of the canal. In 1974, one year after the canal and its remaining structures were entered on the National Register of Historic Places, over 60 miles of the canal and the narrow strip of land on both banks became a state park. A portion of the Belvidere-Delaware Railroad corridor from Bull's Island to Frenchtown was added to the park in the 1990s, and the park's trail system was designated a National Recreation Trail in 1992. The canal route is habitat for over 160 species of birds, 90 of which nest there. The natural area at Bulls Island is home for two unique forest types, the Sycamor River Birch and Elm-Silver Maple, one of the largest Ostrich fern stands, and many more interesting species animal life. Anyone who has strolled the linear trail has likely encountered some geese or ducks looking for food, or seen a few turtles floating lazily down the canal while fish leap from one spot to another.